First day of the journey and the ride was smooth. 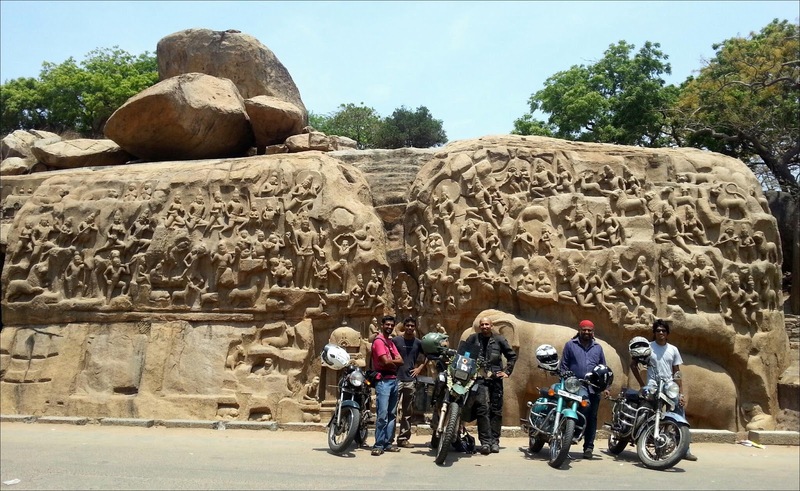 I met up with a few riders from the Madras Bulls Motorcycle Club and we rode down the East Coast Road to Mahabalipuram. After being sent off by the Bulls, I enjoyed the twisting road along the coast till Pondicherry. The Indian Summer is in full swing with temps around 42 C (108 F) and the Tamil Nadu coast is very humid. I stayed hydrated by drinking 5 L of water and having some coconuts and date palm fruit. I reached Trichy and met up with Simrit, a biker who’s been following my trip for a while. He put me up for the night and we got some dinner from his favorite push cart vendor who was making fresh barrotas that came with a spicy kurma and fried goat brain and livers; a hearty meal after a good first day back in the saddle.